MLB Single Apex 460cc Driver Headcover (Select Teams Available) - $22.95 - GolfersEdgeOnline.com - Best Golf Equipment On The Web! 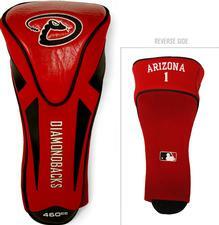 Make the Team Golf MLB Single Apex Headcover the next addition to your golf accessories. This sleek-designed headcover features embroidered team graphics and comes decked out in your favorite teams colors! The fleece lining, durable buffalo vinyl and synthetic suede keep your clubs protected on and off the green. Designed to fit all oversized clubs, the Team Golf Single Apex Headcover is perfect to sport on the course. If you have any more questions about the MLB Single Apex 460cc Driver Headcover (Select Teams Available); do not see the model you are looking for; need custom options; or prefer to not purchase online, then please call us at (630) 656-1291.